The Smith & Wesson 325 Thunder Ranch is a collaboration between a firearm company and a firearm instructor, Clint Smith. Clint possesses decades of experience and teaches at his own facility Thunder Ranch in Oregon. The result is a wheel gun assembled by the Performance Center to fill the role of a modern defensive revolver. The large N frame uses a Scandium alloy to reduce the overall weight to less than 31 ounces unloaded. This makes for a big bore handgun that can be carried all day with less effort than other auto-loaders chambered in .45 ACP. The cylinder and barrel are both stainless steel. The barrel is a two piece design and the factory can set the barrel to cylinder gap to improve performance. The moon clips load and extract incredibly fast. The barrel shroud is where this design really gets interesting. Clint believes a self defense weapons requires a detachable white light, so a removable picatinny rail was included. A ball detent system replaces the traditional locking bolt. This allows the ejector rod to be a bit shorter to clear the weapon light. The front sight is a gold bead on an interchangeable blade system should you desire to switch sights. The hammer and trigger are also forged rather than current production metal injection molding for enhanced longevity. The Performance Center completes an action job with a great trigger out of the box. All these features combine to create a quality revolver for those that still prefer a wheel gun over auto-loading options. Master-Tac holster and single moon clip carrier. North Mountain moon clip holder (long posts). 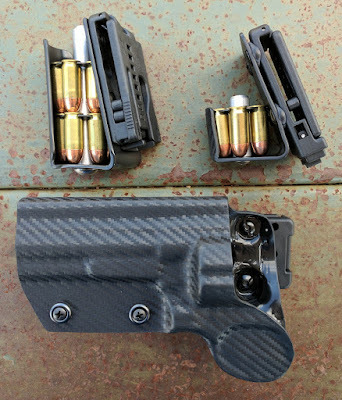 A quality revolver requires a quality holster and carrier for spare ammunition. For range and competition use, I prefer outside the waistband holsters made of kydex. Master-Tac Holsters produces great gear for competition or carry. Bill is always polite and I typically have the products at my door in less than seven business days. The moon clip carrier with short posts fits the .45 ACP round perfectly. I will order a couple more over the double stack design. The North Mountain long post (made for .38/.357 rounds) worked in a pickle, but I think the short post would be easier to manipulate. 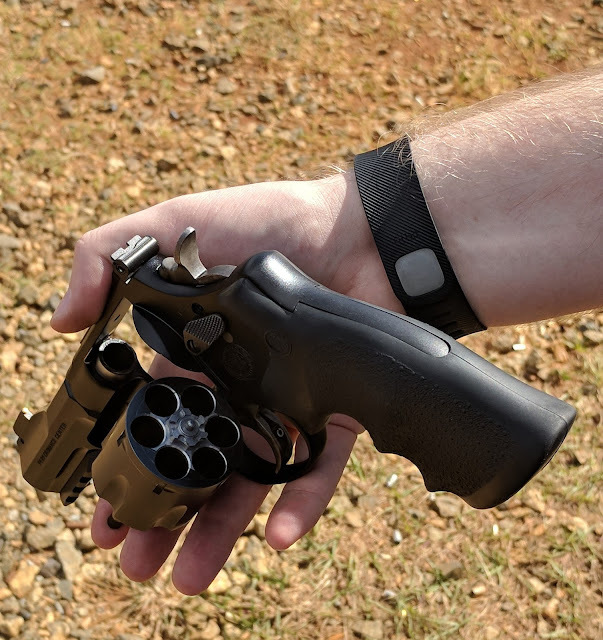 Shooting the S&W 325 is a bit challenging due to the lighter weight of the gun. Other than an Colt Single Action Army, I have very little trigger time with .4xx caliber revolvers. 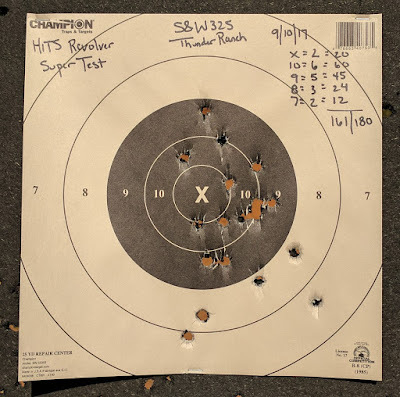 I have a bit more experience with auto-loaders in this caliber and recognize the difference in full power ammunition and lighter loads for competition. I was curious to see if this translated in the wheel gun, so I tested a few different rounds at different power factors. Below is a table outlining the different ammunition that was tested in the revolver. I am still looking for two lighter factory loading; a 158 PF for IDPA and a 168 PF for USPSA. Although the 230 grain Federal is reported to be loaded to a higher velocity, the Freedom 230 grain actually produced the most felt recoil. 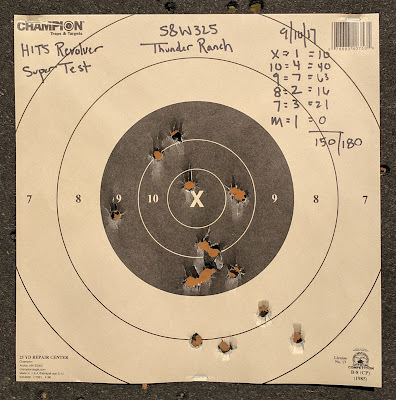 The Freedom 200 grain was definitely the softest shooting round I tried. I largely shoot minor power rounds (.38 Specials, .380 ACPs, and 9mms), so the recoil of a major power factor rounds is a bit stiffer than expected. Nothing produced painful recoil, but you can definitely tell you are shooting major. Short but dedicated range sessions with regular dry fire practice are my recommendation. 6 rounds in 12 seconds from 15 yards. 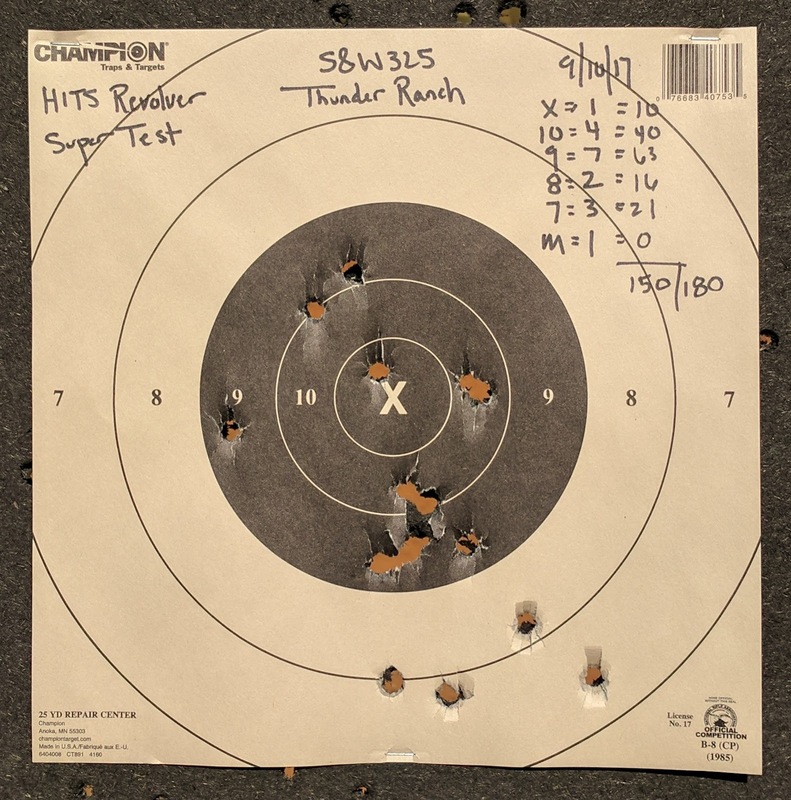 6 rounds in 8 seconds from 10 yards. 6 rounds in 4 seconds from 5 yards. My first attempt after three quick warm-up groups. Before running the drill, I shot one moon clip of each of the three rounds to see which round shot closest point of aim to point of impact. The Freedom 174 PF was pretty much dead on, so I grabbed three moons. I failed with a 150/180. I was trying to push to ensure I made the time limit but tracking the front sight was a difficult. I even had a miss. After working target transitions and shooting a few groups at 25 yards, I attempted the Super Test again. I was closer to passing the second time but only shot a 161/180. Overall, the grouping is a bit tighter even though I threw a significant portion of the shots outside the black. I was rushing at the five yard line trying to make it under the four second limit. I should mention that this is not my revolver. It is on loan from a family member who also enjoys revolvers. 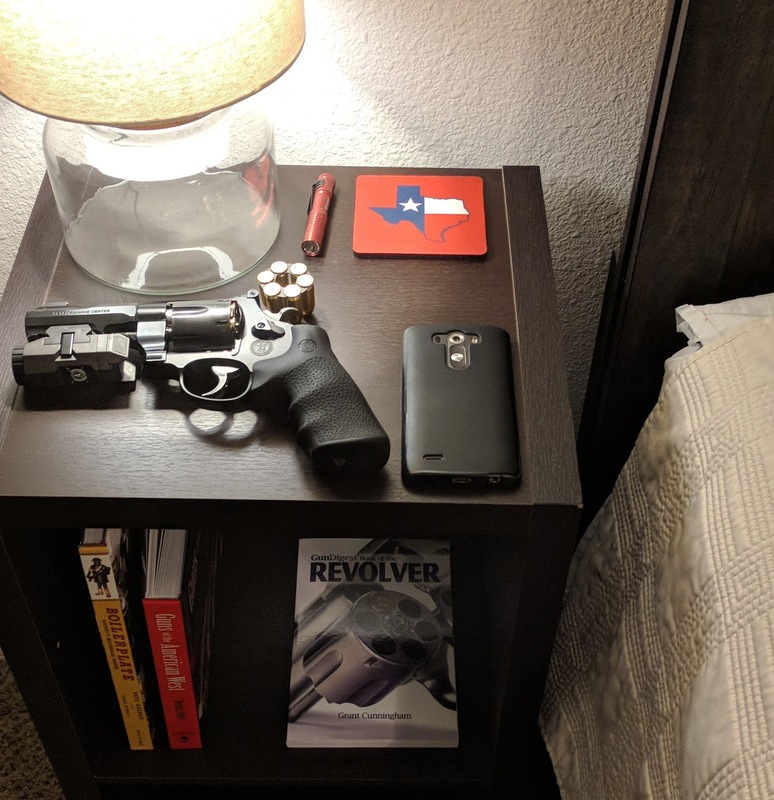 This is his favorite handgun, and it serves the role of nightstand gun. His theory? The gun is manageable one handed, sports a weapon light, and fires a proven round operating at a low pressure. It is a great home defense weapon if you don't want something with a stock. The 325 has also served as a woods gun on day hikes when he visits the property. I think a day with a steel revolver would make me appreciate the Scandium frame a bit more. The Smith & Wesson 325 Thunder Ranch is loaded with features designed to create the ideal defensive revolver. After a day on the range, I'm not sure that the light weight is a benefit for a gun chambered in .45ACP unless serving as a primary carry. 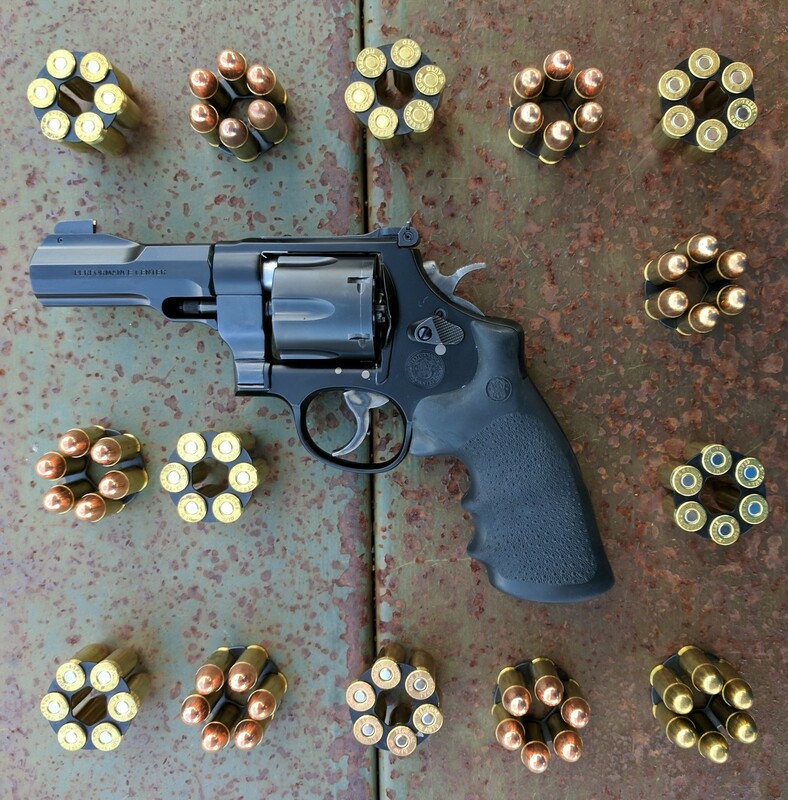 For my purposes, a S&W 625, the steel cousin of this revolver, is a better option. The added weight soaks up a bit of recoil on the range or in competition but the reloads should be faster than a speed loader. I mentioned before that this is the first revolver chambered in .45 ACP that I have tested. If I were to carry this out and about, I would definitely consider a leather holster. Carrying inside the waistband might be a bit challenging with the four inch barrel and large cylinder, but it could be done. 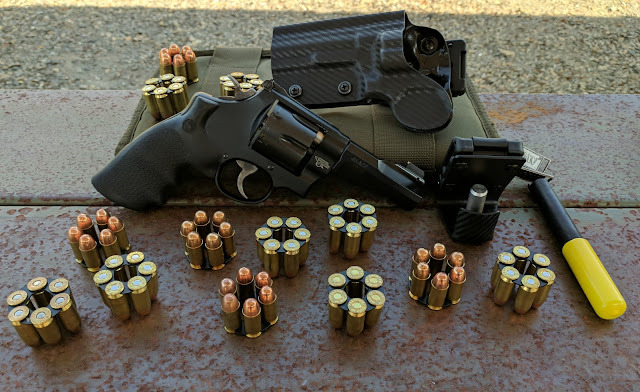 The 325 is a winner if you want a lightweight carry revolver that shoots a the same round as a 1911.